Given the long-term nature of the proposed cooperation and to ensure continuity of operations, a coherent management framework as illustrated was established. The highest decision making body of PathoGenoMics is the Network Steering Comittee ( NSC ). The NSC consists of representatives of the national funding bodies and charities at senior director level, who are reponsible for the implementation of the involved national programme activities. The External Advisory Board (EAB) consists of high-level experts (two per partner country) from leading public research institutes, the biotechnological and pharmaceutical industry as well as experts for legal and regulatory issues and consults the NSC at all levels of the project. The Coordinator (CO) will be supported by a Joint Secretariat (JS) at the coordinators location. The tasks of the CO include all aspects of the administratitive support of the coordinator and the other management bodies as well as all the entire communication and interaction with the European Commission. 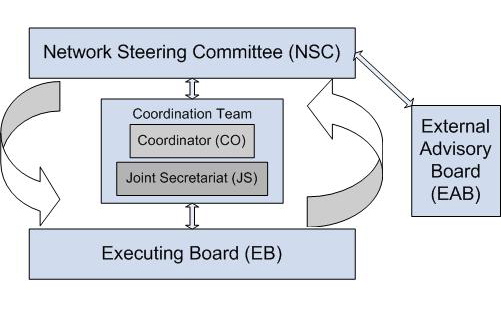 The Executing Board (EB) consists of the Workpackage Leaders and is responsible for the coordination, planing, conducting, monitoring and reporting of the Workpackage activities. The EB meets quarterly in order to report and discuss the project progress.